Educational test kit for measuring Nitrogen, Phosphorous and Potassium levels. Designed to take a 1 inch (approx 2.5 cm) core sample to a depth of 25 cm / 10 inches. Kit for testing and demonstrating different soil textures and properties by measuring Sand, Silt and Clay fraction. Measures pH levels withina range of 4 to 8. 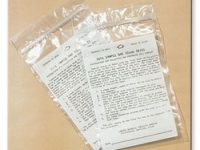 Plastic zip-lock bags printed with instructions for collection and preparation of soil samples.